Italian earrings made of 925 silver are an excellent choice both for everyday stylizations and for outfitting. They are small, delicate and really feminine - they are an interesting addition to your outfit. 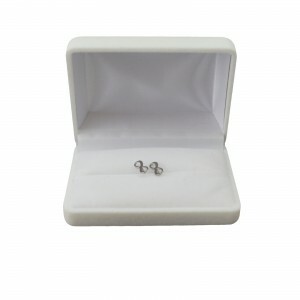 We offer silver or gold earrings with ear plug type. In our offer there are also bracelets to the set, so you can easily create a stylish set of jewelry - fashionable and characterized by the highest quality. We cordially invite you to familiarize yourself with the entire offer. Beautiful silver earrings with purple heart-shaped crystal. This stone beautifully shimmers in the l.. Subtle gold-plated earrings, made of high quality 925 silver Italian. The wheels thanks to their tim.. Subtle gold-plated earrings, made of high quality 925 Italian silver sample. Thanks to their timeles..
Beautiful crystal earrings made on open earwire. Crystals placed in earrings beautifully shimmer in .. Subtle earrings made in Italian, made of high quality silver gilded 925. They are great for everyday.. Subtle earrings made in Italian, made of high quality 925 silver. They are great for everyday wear a.. Subtle earrings made in Italian, made of high quality 925 silver. Earrings were made in the shape of.. Hanging earrings celebrity, made of high quality 925 silver. Decorated with zircon and clover suspen.. Hanging earrings celebrity, made of high quality 925 silver. Decorated with zircon and heart suspend.. Subtle earrings made by Italian celebrity, made of high quality 925 silver. The composition is based.. Subtle earrings made in Italy, made of high quality 925 silver. Earrings made with decorations. Earr.. Subtle earrings made in Italian, made of high quality 925 silver. Earrings are made in the shape of .. Subtle gold-plated earrings, made of high quality 925 Italian silver sample. Owale thanks to their t.. Hanging earrings made in Italy, made of high quality 925 silver. Earrings on a stick, hanging bunch .. Subtle earrings made in Italy, made of high quality 925 silver. The composition is based on the .. Subtle earrings made in Italy, made of high quality 925 silver. The composition is based on the clas.. Subtle earrings made in Italy, made of high quality 925 silver. Earrings were made in the shape of a..